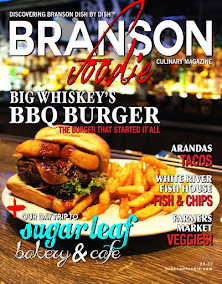 As seen in the Premiere Issue of Branson Foodie Magazine, now available for order! When people say that a picture is worth more than a thousand words, this one pretty much sums it up! 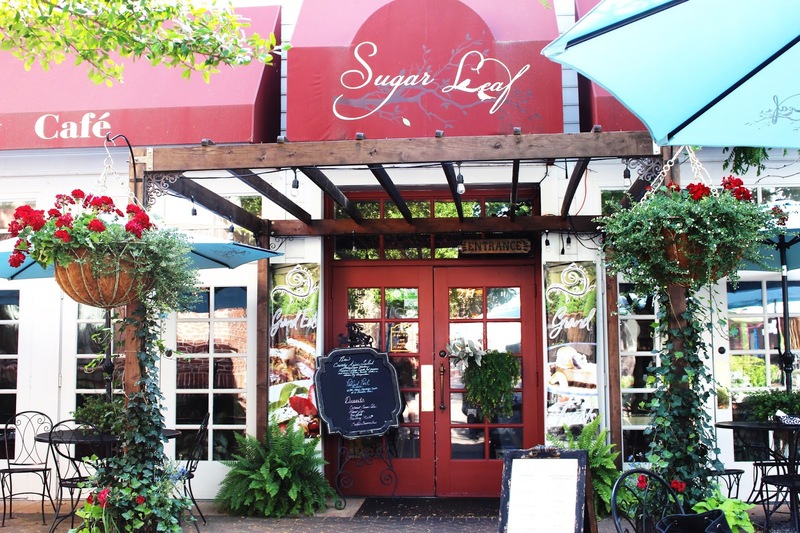 Here’s the story of what we experienced on our day trip to Sugar Leaf Bakery & Cafe. And contrary to what we expected, it’s much more than beautifully decorated cakes and perfect little cupcakes! SUGAR LEAF BAKERY & CAFE is a sweet treasure hidden among the Christmas stores and art galleries of the Grand Village Shops in Branson, Missouri. We found Sugar Leaf while trolling the social media world of Instagram for stunning photos of delicious food. And there we saw some of the most beautifully decorated cakes we could imagine. Little did we know that they also serve brunch and lunch at their beautifully decorated restaurant. A photo of a bowl full of buttercream frosting and some perfectly pink cupcakes later, we had to go check the place out. 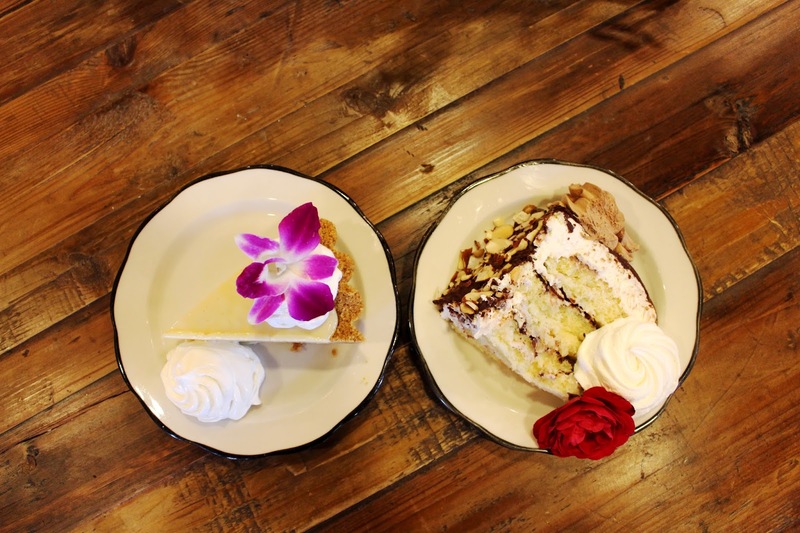 Their cakes are among the best desserts we’ve ever tasted, but their pulled pork sandwich holds a place among our favorite barbecue around, which is something you wouldn’t expect for a bakery. 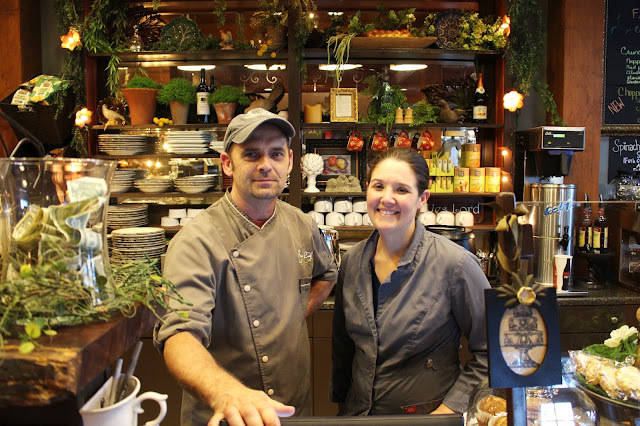 Sugar Leaf Bakery & Cafe is owned by Chef Todd Jansen and his wife Lori. They are joined by their many children along with their spouses, and grandchildren as well. 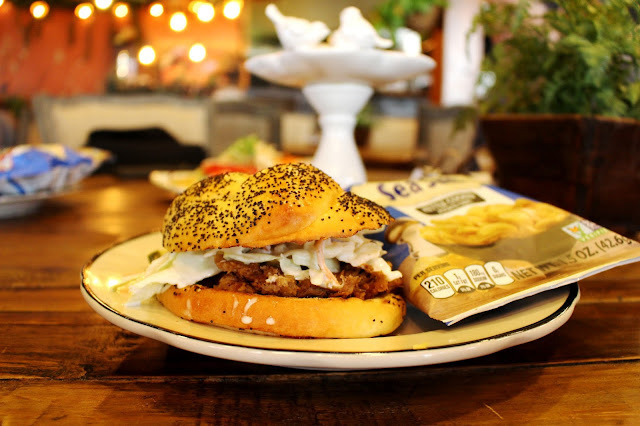 A family run business, Sugar Leaf Bakery & Cafe is a sensory treat of baked goods, sweet treats and slow cooked meats. The decor itself was curated by Lori Jansen from flea markets and antique stores. There are the vining plants, gorgeous pictures of intricately decorated cakes and a precious theme of little birds throughout the room. Large round wooden tables are surrounded by high-backed chairs upholstered with fine white fabrics, and a lovely mural by local artist Carol Fildes is on the back wall of the room. It has a lot of character, while still spacious. 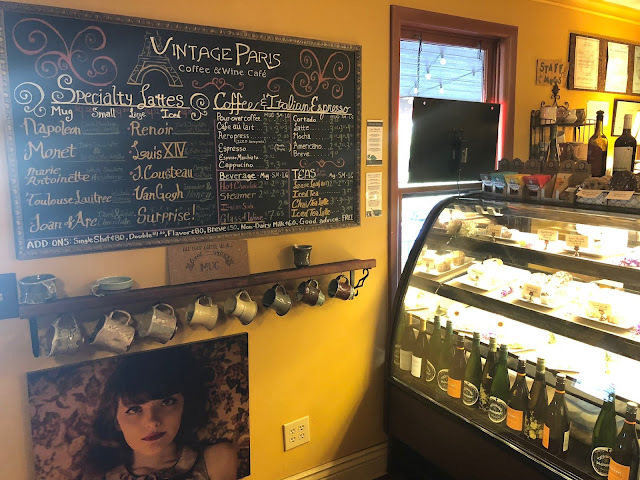 The outdoor patio conjures up what it must be like to sit at a Café in Paris, with wrought iron tables scattered about the brick courtyard, umbrellas for shade, a water fountain trickling in the background and the summer breeze blowing by. We sat down with the Jansen’s daughter, Amanda Stout, and she gave us some history about Sugar Leaf, as well as some wonderful items to taste from their menu. Starting out as a wholesale cookie company, the Jansens ended up opening shop about fifteen years ago right here in Branson. The business eventually grew into what it is today, a bakery and cafe, specializing in homemade breads, delicious sandwiches, fresh seasonal salads and desserts to die for. Their bakery produces everything from simple cakes and pies to wedding cakes that are some of the most intricate and uniquely artistic designs we’ve ever seen. It’s definitely a talented bunch making these creations. Even the cupcakes are the prettiest we’ve ever seen, and at the same time manage to look moist and delicious. You can order wedding cakes by phone or email, but keep in mind that they tend to book up about a month in advance for all custom orders. But at Sugar Leaf, you’ll be accommodated with cake tastings and one on one meetings so that you can get exactly what you want for your big celebration day. 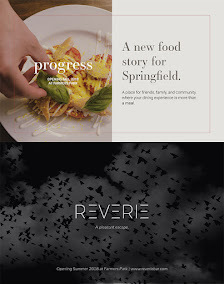 Most likely, they will exceed your expectations with design and flavor. Even their “simple” cakes don’t look simple to us. From the detailed design to the ingredients, they are beyond what we would call basic. The pulled pork is slow roasted in house and served with a creamy homemade slaw and topped with a freshly baked brioche bun. The sweet and smoky barbecue sauce is a secret recipe by Chef Todd Jansen. Soon, our lunch arrived, and before us were set three lunch items: a pulled pork sandwich, their special Ultimate BLT and an Asian chicken salad. “We really have a love for good homemade food, because you don’t get that very often,” said Amanda. The pulled pork is slow roasted in house and served with a creamy homemade slaw and topped with a freshly baked brioche bun. The sweet and smoky barbecue sauce is a secret recipe by the Chef. You can taste each layer of this barbecue sandwich. The bread compliments the meat which in turn compliments the coleslaw, and there is a creaminess that’s indescribable. The Ultimate BLT is basically a club sandwich, but amped up with superior ingredients. It’s stacked with turkey, pepper jack cheese, smoky bacon, topped with a house made aioli and piled onto homemade tomato basil bread. 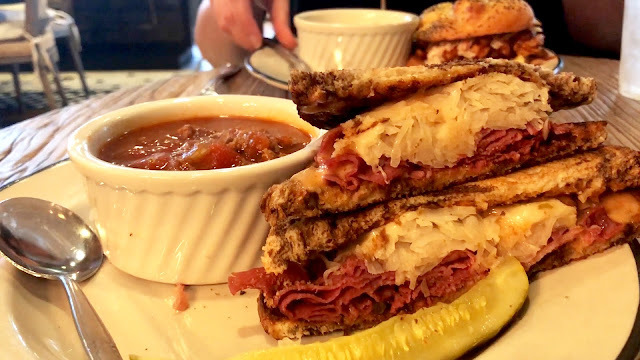 It’s one of their most popular sandwiches, and we could see why! 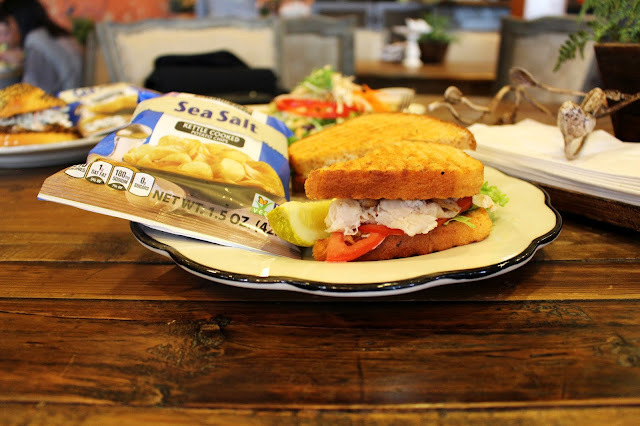 It is the best club or BLT sandwich we have ever had. It’s insanely good, and there is a smoked flavor that just brings it to the next level. The Ultimate BLT at Sugar Leaf Bakery stacked with turkey, pepper jack cheese, smoky bacon, topped with a house made aioli and piled onto homemade tomato basil bread. Homemade bread makes all the difference, and Todd and Lori Jansen are known to be up at the crack of dawn baking their delicious loaves daily, along with all of the homemade sauces, soups and salad dressings. You can even purchase loaves of bread, but they do ask that you call ahead to order so that you get the freshest bread possible. 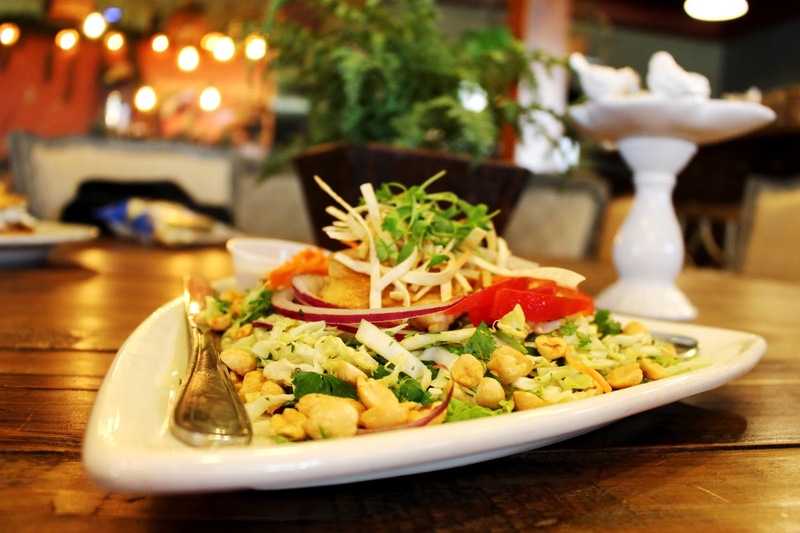 We then tried the Crunchy Asian Salad, and just looking at it, we were hesitant to dig in because it was so pretty. It’s crunchy, light, and brings to life what fresh cabbage should really taste like. The peanuts lend even more crunch, fresh bell peppers, and crunchy noodles on top and a sweet glazed chicken that rounds out the dish. The brightness of cilantro brings it all together and the Asian vinaigrette lends just a hint of spice. It’s a great salad for lunch or dinner, and we’ve never had one like it. Then Amanda offered us some homemade peach tea. The tea is served with a slice of fresh peach, and the sweetness went perfectly with our lunch. The Crunchy Asian Salad is a beautiful combination of fresh cabbage, peanuts, bell peppers, crunchy noodles, cilantro, sweet glazed chicken and a house-made Asian vinaigrette. Though we wanted to finish all of the sandwiches and the salad, it was time for something even sweeter. The cakes available daily at Sugar Leaf include Strawberry Fields, Almond Joy, carrot cake and coconut cream cake. We chose the Almond Joy cake, which has layers of white cake, a coconut chocolate almond filling and chocolate glaze with slivered almonds on top. 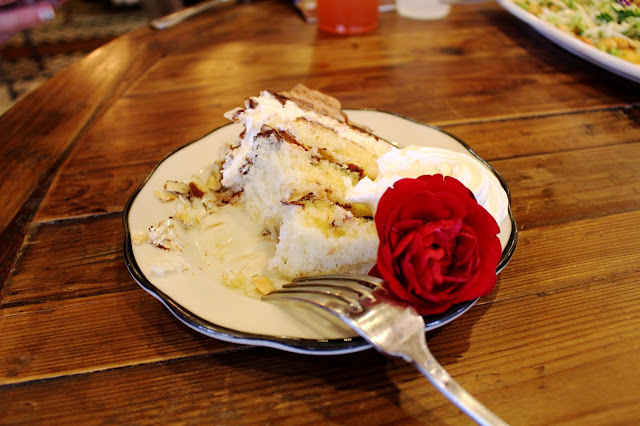 It’s served with a dollop of fresh whipped cream and an edible red rose. It looked incredibly moist, with layers of cream stacked throughout the large piece. We also tried the key lime pie. 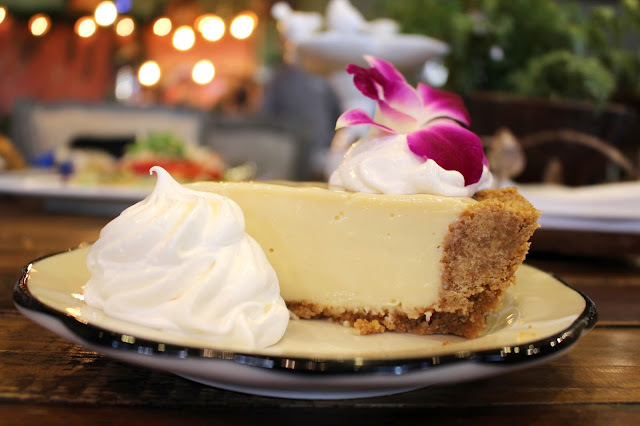 It had a buttery, crumbly graham cracker crust, with a very rich yet light key lime creamy custard filling. A pink and white orchid placed on top of the pie was also edible. It was so pretty, it literally made us feel like we were somewhere tropical. These desserts tasted even better than they looked, which is a lot to say! We almost felt guilty for breaking the prettiness with our forks. 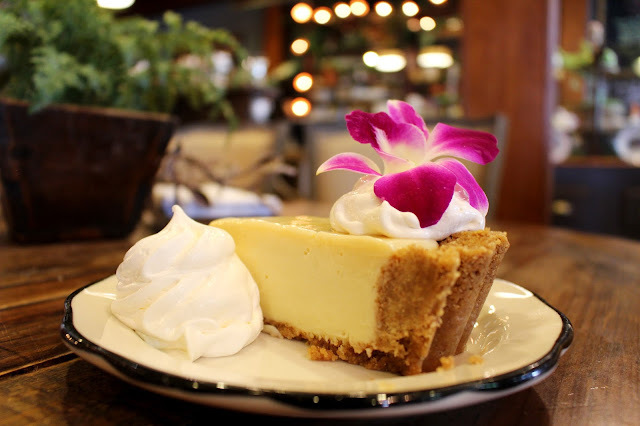 This homemade Key Lime Pie has a buttery, crumbly graham cracker crust, with a very rich yet light key lim creamy custard filling. It's utterly irresistible! We can’t say enough about how much we love this place. 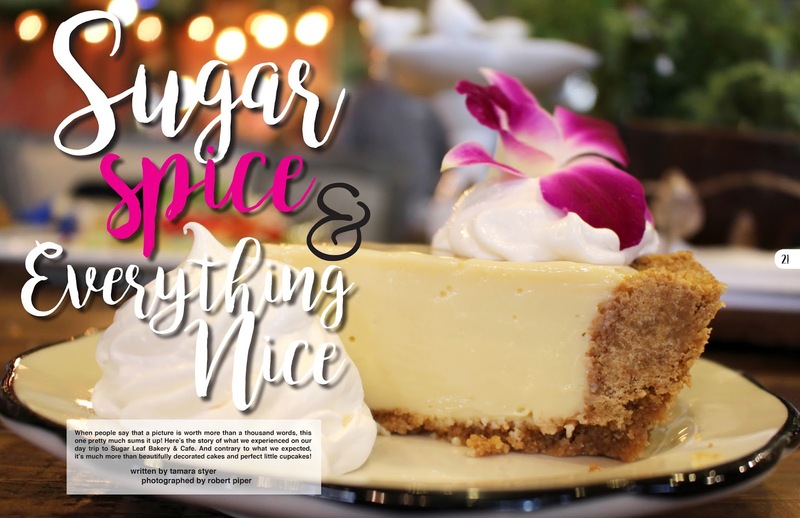 The part that excites us is when food is given that fine attention to detail, and anyone could tell immediately that there is a lot of care put into every single thing made at Sugar Leaf Bakery & Cafe. It’s simply magical. Whether you’re vacationing or if you’re a #Bransonite like us, this is a must-see, and you’ve got to eat here. Simply put, we were blown away by this restaurant. We will definitley keep coming back! It’s safe to say that every guest will be treated like family each and every time you visit. At the end of our meal, we contemplated whether to polish off the rest of our sandwiches, salad and desserts, but we opted to take the rest to go and snack on them later. The Almond Joy cake from Sugar Leaf Bakery & Cafe is just as delightful as it sounds, with layers of white cake, coconut chocolate almond filling and chocolate glaze with slivered almonds on top. Saying our goodbyes to our new friends at Sugar Leaf, we headed to Tablerock Lake and sat by the water with a picnic dinner of leftover pulled pork sandwich, BLT, Asian salad and our perfect desserts, all of which was just as good left over. While we ate, the sun went down beneath the horizon, and the sky became a hazy wash of orange and pink dotted with pale stars. We watched as boats sped by and fishermen cast their lines. Soon, the Branson Belle floated by all lit up from within its giant belly. 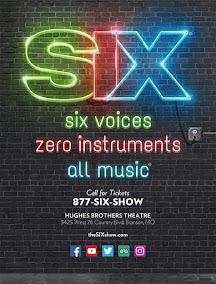 We waited until the night sky came out, reveling in yet another lovely day in Branson, made even more special as we enjoyed our delicious cake and the sights and sounds of the gorgeous lake. It really was the best day ever. 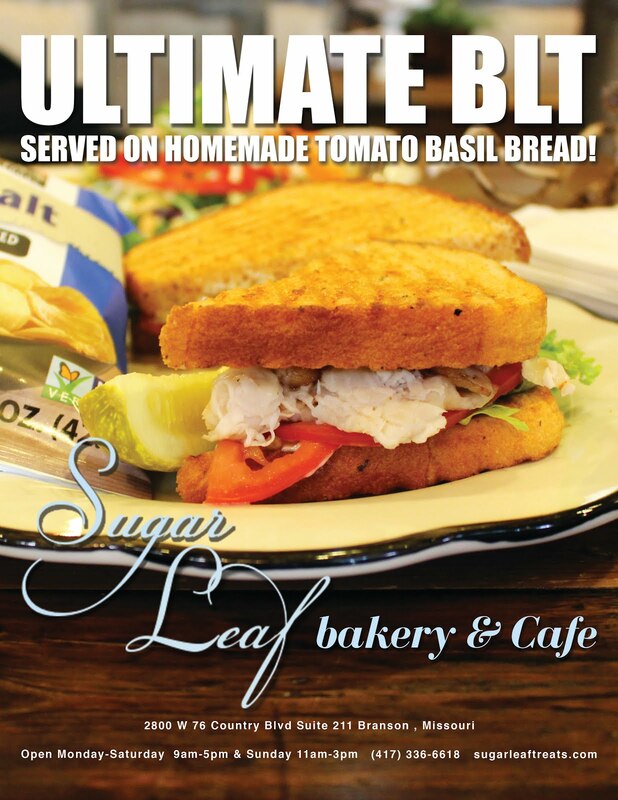 Sugar Leaf Bakery & Cafe is located in the Grand Village Shops off the Branson Strip at 2800 West Hwy 76, Suite 211. For orders, call them at (417) 336-6618 or visit their website at sugarleaftreats.com.